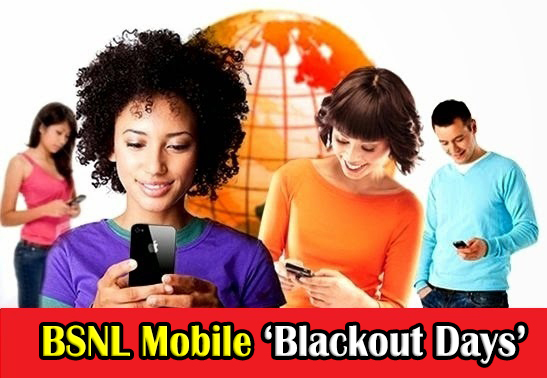 Bharat Sanchar Nigam Limited (BSNL) has announced the revised list of Blackout Days for the Calendar Year 2016 for its prepaid mobile customers in Kerala Circle. As we reported, the PSU published separate list of 'BSNL Blackout Days 2016' for its Prepaid and Postpaid Mobile customers earlier in December 2015. Now, BSNL Kerala Telecom Circle has published the revised list of Blackout Days 2016, as per the instructions from BSNL Corporate Office. The list of Blackout Days 2016 is now common for both Prepaid and Postpaid Mobile customers. It include National Festivals like - Holi, Pre-Diwali, Diwali and New Year Eve. The reduced tariff on Voice / SMS STVs (Special Tariff Vouchers), discounted calling offers like - 'Friend & Family' & 'Pyari Jodi' etc. also will be withdrawn, during blackout days.' For all 2G/3G mobile plans which are offered with initial freebies and monthly freebies on Voice and SMS, the concession on Voice Calls / SMS will be not be applicable and they will be charged as per their Parent Mobile Plan on these Blackout days. This latest revision is really beneficial to BSNL Prepaid Mobile Customers of Kerala Circle because, festivals like Vishu, Onam and Christmas are exempted from the list. Dear readers, please share your views and opinions about this revised list of Blackout Days by BSNL via comments with us.